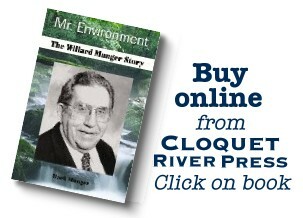 In 1999, the year he died, Willard Munger was given the National Wetlands Award for Outstanding Program Development for championing the Minnesota Wetland Conservation Act. The law provides Minnesota with wetland protections that exceed Federal standards. Environmental and Natural Resources Trust Fund; Solid Waste Reduction and Recycling Act of 1989; Reinvest in Minnesota (RIM) Program; Groundwater Protection Act of 1989; Toxic Pollution Prevention Act; Energy Task Force to Develop Alternative Energy Resource; helped secure millions of state and federal dollars to clean up the St. Louis River; Ninnesota Wetland Conservation Act; led campaign to fund research into frog deformities; ban on use of DDT insecticide (partial list). The program will portray Mr. Munger’s life through his own voice and the voices of the people who knew him. The program will visit the landscapes and enterprises that shaped his character and values from a depression era farm and a lake near Fergus Falls, to a World War II ship building yard and a family store in the Duluth area and to the corridors and hearing rooms at the State Capitol. with a tax-deductible donation through WDSE-TV. Your donation will be receipted by WDSE-TV. Author Mark Munger talks about his book on TPT's Almanac. Click here for ALMANAC ON DEMAND and search the archive for "Munger".